In this feature article, Caroline Raine discusses the 2019 changes to the emergency action codes (EACs) as a result of the new 2019 version of the European Agreement concerning the International Carriage of Dangerous Goods by Road (ADR). In the UK, the Hazchem EACs must be used for the domestic transport of dangerous goods in tanks and in bulk. This system of marking differs from the ADR requirements, which use hazard identification numbers (HINs), also known as the Kemler/Kemmler Code, which all other tankers and bulk vehicles must use. EACs were first introduced in the early 1970s following a fatal incident on the M6 Motorway near Wigan. A nurse was on her way to help out at the scene of a multiple accident when she walked through a stream of powerful acid spilling from a road tanker. She died as a result. A voluntary Code of Practice using EACs was introduced and are referred to as the Hazchem system. The Hazchem system was incorporated into UK law in 1981 with the first road tanker regulations. EACs consist of a two/three-character code that must be displayed on all Great Britain-registered road and rail vehicles that carry dangerous goods in tanks or in bulk on domestic journeys within the UK. 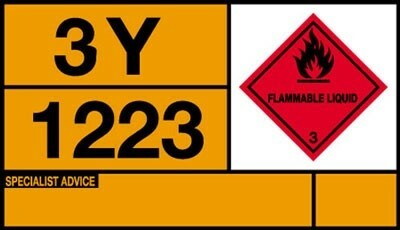 Hazchem marking consists of a large one-piece panel with fixed dimensions containing the primary hazard danger symbol against a white background on the upper right hand side and, to the left of it, an orange panel divided horizontally in two (Figure 1 below). The EAC is shown in the top section and the UN number (which identifies the substance) at the bottom. Occasionally, a second danger symbol may be shown next to the Hazchem placard, where required, to indicate environmental hazards in addition to the primary hazard. This is commonly seen on petrol tankers, for example. The panel is completed with an emergency telephone number, from where specialist advice can be obtained on the properties and hazards of the dangerous goods whenever the tank is in transport, including stops. This normally means 24 hours a day, 365 days a year service. Some voluntary schemes also require that a 24-hour, 365-day service be available. The Hazchem system is also used in Australia, Malaysia and New Zealand. the risk of violent reaction of a substance or mixture becoming in contact with water. These placards are seen in the UK on vehicles being used for international road and rail transport under ADR and RID (Figure 2 above). 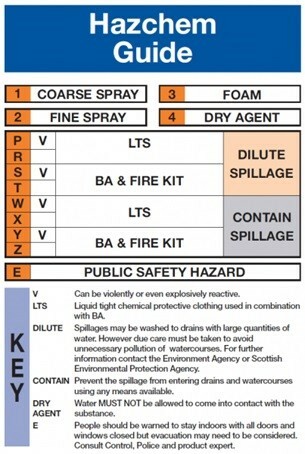 The EACs of dangerous goods, once classified and identified correctly, can be determined from the UK EACs list which is provided by the National Chemical Emergency Centre (NCEC) at www.the-ncec.com. The HIN can be determined from Chapter 3.2 of ADR and RID. There has been, and still is, continuous debate as to the merits of Hazchem and Kemler. The Hazchem system is favoured by emergency responders in the UK due to the easy-to-interpret information that is provided. However, attempts by UK Government officials in the early 1990s (and before) to persuade the rest of the ADR and RID contracting States of the value of an EAC code system proved unsuccessful. EACs provide a quick assessment to the emergency services of what actions should be taken during an accident. The fire and police services use the specific characters and numbers to determine which actions may be necessary, during the first few minutes of an incident involving dangerous goods. The idea behind the EACs is that emergency responders, especially the fire service, carry a small card with them known as the “Hazchem Scale Card” that translates the EACs into immediate action to be taken at the scene of an incident until specialist advice and help can be obtained. EACs are characterised by a single number (1–4) and either one or two letters (depending on the hazard) (Figure 3 below). The number in the EAC indicates a suitable fire-fighting method in ascending order of preference. 1 denotes coarse water spray. 2 denotes fine water spray. The EACs list occasionally shows an EAC to have a • (dot) before the 2 or 3. 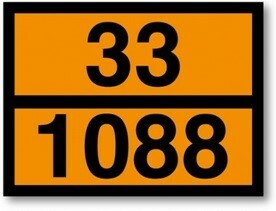 The dot is not shown on the vehicle plates, only in the published list. •2 denotes alcohol resistant foam, but if not available use fine water spray. •3 denotes alcohol resistant foam, but if not available normal foam can be used. whether the spillage needs to be contained, or whether the substance or mixture can be diluted with water. It should be noted that the dilution advice does not necessarily accord with protection of the environment considerations so that even if dilution is attempted, the diluted substance or mixture should not normally be allowed to run off into the soil, drainage systems or water courses. The second letter, if any is used, is “E”. This used to stand for “Evacuate”, but is now interpreted as “Public Safety Hazard”, with people being warned to stay indoors with all doors and windows closed, preferably in rooms upstairs and facing away from the incident. Ignition sources should be eliminated and any ventilation stopped. As the effects could spread beyond the immediate vicinity, all non-essential personnel should be instructed to move, for example, at least 250m away from the incident. Evacuation may need to be considered after consultation with the incident control, police and product expert, but in most cases staying inside buildings will be the safer course of action. (!) the substance may have a particularly deleterious effect on chemical protective clothing. “B” indicates that chemical protective clothing should be gas-tight with breathing apparatus. HINs consist of two or three figures and, in general, the figures indicate the following hazards. 2 — Emission of gas due to pressure or to a chemical reaction. 3 — Flammability of liquids (vapours) and gases or self-heating liquids. 4 — Flammability of solids or self-heating solids. 5 — Oxidising (fire-intensifying) effect. 6 — Toxicity (or risk of infection). 9 — Risk of spontaneous violent reaction. The letter “X” indicates that the substance will react dangerously with water. The Carriage of Dangerous Goods and Use of Transportable Pressure Equipment Regulations 2009 (SI 2009 No. 1348) (CDG 2009) (as amended) adopts the ADR provisions for domestic transport as well as for international road journeys. The use of EACs is permitted under Directive 2008/68/EC — Inland Transport of Dangerous Goods Directive (ITDGD) where the need to display the ADR HIN is replaced with the British developed EAC. CDG also defines for tankers the additional requirement to display an emergency response telephone number. The EAC numbers are listed in the publication, Dangerous Goods — Emergency Action Code List (EAC list), which is updated and reissued every odd numbered year. It is also available to download from the NCEC website. The new EAC list 2019 has now been published. There are a number of editorial changes. The new list is effective immediately in connection with the use of ADR/RID 2019 Edition and is mandatory from 1 July 2019. The Emergency Action Code List 2017 should no longer be used from that date. ADR 2019 sees the introduction of new UN numbers and so these have been assigned new EACs and will be added to the EAC list as follows. The following new entries have been added. Articles containing non-flammable, non-toxic gas, N.O.S. Articles containing a substance liable to spontaneous combustion, N.O.S. Articles containing oxidising substance, N.O.S. The entry for UN3302 has been changed as follows. There are also additional changes for lithium batteries. The EAC list 2019 will supersede the 2017 list and is effective from 1 July 2019. The 2017 list should no longer be used from that date. Dutyholders are required to use the 2019 EAC list for the application of the appropriate EACs under the CDG 2009 (as amended) and of the Carriage of Dangerous Goods and Use of Transportable Pressure Equipment Regulations (Northern Ireland) 2010 (CDG 2010) (as amended). The NCEC has not made any radical changes to the EACs in the 2019 version. This was due to a number of factors, but mainly the fact that it was felt that the chemical industry have other challenges, namely Brexit.